Calculators are cool. I still have my OG TI-83 and it sits on my desk to this day. It still works and has space invaders and Drugwars installed on it. If you don’t remember Drugwars you probably weren’t as cool as me, or you paid more attention in class. I loved building an empire on my graphing calculator. If only it had been an early retirement calculator, maybe I could have reached financial independence at 14 instead of 30. ? After seeing the crazy response to my $50 a day early retirement strategy, I’m now on a mission to share tools that can help you get there. This is the first calculator of many that I’m building and will eventually put into one place on Millennial Money. I developed this calculator from a spreadsheet created by a blogger friend of mine, Chris at Keep Thrifty. I built this calculator myself, so go easy on me if it breaks down or blows up your phone. Check this craziness out and let me know what you discover. Are you on pace to retire when you want? Do you have enough money today to retire at 40, 50, or 65? How much money will you need to retire early? The cool thing is that this calculator can read the future. Not really. But it hopefully can help you understand how things like saving rate will impact when you can retire. You can also control a lot of the variables that I see missing in a lot of retirement calculators. Who know’s what the inflation rate or your tax rate will be in retirement. This is what makes trying to plan for early retirement so challenging. But the best way to increase your chances of reaching financial independence is to use an early retirement calculator like this to test a number of different scenarios. Here are some baseline numbers and ideas for you to consider and a guide for how to use the calculator. Current Retirement Account Balance: Add up all of the money you have in your investment retirement accounts. Target Retirement Age: This is where you can really have some fun because you can set it at anything you want and it can tell you if you are on pace to hit it. Are you on pace to retire at 65? You might already be on pace to retire when you want to. If that’s you then congratulations, you’ve reached retirement freedom. Safe Withdrawl Rate: This is what percentage of the money you will start withdrawing when you hit your target retirement age. A common assumption is that 4% is a good safe bet, but 3-6% are worth testing. You rarely want your safe withdrawal rate to be higher than your investment growth rate (because you want your money to keep growing!) 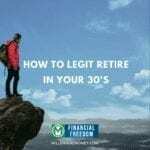 It’s important to note that you will also likely keep working past your target retirement age and could have some additional funds, thus reducing your withdrawal rate. Monthly Contribution: This is how much money you are going to contribute until your target retirement age – then you can stop contributing! This can be tough to estimate, but a simple way is by multiplying your monthly salary by your target savings rate (5-50%+ depending on how aggressive you are). I saved 82% of my income one, but it was super tough. My personal savings rate tends to hover between is typically around 40% every month. For this calculator test out the difference between different amounts to see how it impacts whether you can retire early. I like to break down my saving goals into daily goals and will be building a separate daily calculator soon. Investment Growth Rate: This is the annual rate growth rate that you expect for your investments. I personally always use 5% or 6% (which is a pretty conservative return over any 10 year period). Over the past 10 years, a total market index fund (which tracks the entire US equities market) has returned 7%. So it’s worth testing how different rates impact your outcome. It is very difficult to get an annual rate of return of 8% over any long period and you will need a pretty aggressive portfolio to achieve those returns. It is a personal choice how much risk you are willing to take to reach your early retirement goals, but in my opinion, it’s not worth investing in risky investments to do so. Don’t play the lottery – invest using a proven diversified strategy like the coffeehouse portfolio to achieve positive long-term gains. Inflation Rate: Almost everything gets more expensive over time and the dollar that you make today will have less purchasing power next year when things are more expensive. This is why if you just leave money in a saving account you are actually losing money. Inflation is measured using the consumer price index (which tracks the average cost of commonly used goods) and typically goes up between 1-3% each year. Inflation compounds just like investments, so one of the keys to successful investing is that you want your investments to compound faster than inflation. For the purposes of this calculator, I would recommend using 3%. Expected Tax Rate At Retirement: This has a huge impact on how much money you need to retire early. There is no way to predict what tax rates will be in 5, 10, 20, or 30 years, but the commonly held belief is that your tax rate will likely be lower when you retire (and are making little to no income). I typically use 20% or 25% to be safe. I think it’s unlikely that we will be taxed at more than 25% when we are making very little income. A lot of crazy things could happen, but I think this is a safe range. Expected Retirement Annual Expenses: Put how much mone you expect to spend annually once you retire but in today’s dollars because the calculator adjusts it to what you will need back on the inflation rate you entered. You need to save a lot more money for retirement the more you plan to spend. It’s a huge difference. My personal estimate is I will need $50,000 a year to live the lifestyle that I want to live. To find your number check out how much money is enough. Alright go crazy and let me know what you think! Looks awesome Grant! Excited to see this in calculator form. Hope this helps keep people going on finding their retirement path! It says NAN and tells me I will retire in 100 years! I don’t know about the 10 year,growth rate my yearly growth rate on my funds is 2% only and I invest in vanguard 500. it’s very disheartening. Oh no. I’m guessing it’s that 2% rate. But a Vanguard 500 fund returns a lot more than that – over 17% in the past 12 months. What am I missing? Mate I’m struggling to get it calculate correctly!? It’s saying I’m already there but balance is $NAN. But I’ve only got $100k in the current retirement amount! 🙂 I’m using my mobile so maybe it needs to be on desktop? Oh man Danno. Yeah I’d recommend trying it on a desktop. It got a little weird on a few people’s phones. I’m hopeful I will get better at building these over time. Very cool, Grant! I just ran my numbers, and confirmed I’m in good shape to retire in 14 months!! Woot Woot! Nice! You need to throw a huge party and invite all us bloggers! Super excited for your retirement (and that this calculator worked!). It’s reasonable to look at calculators like this. 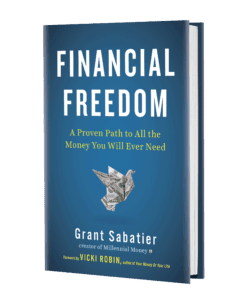 However, the whole premise of the safe withdrawal rate and the 4% rule is based on consuming your nest egg slow enough to sustain you for x number of years after retirement. Unfortunately, DALBAR has shown time after time that the average stock market investor way underperforms the market. Therefore, the assumptions built into these calculators tend to over-estimate the amount of money that most people will have at a given time. Personally, I prefer to look at how much my monthly expenses are and then create enough stable passive income to exceed that number. Great points Dennis. The average stock market investor underperforms the market because they don’t invest in the entire market. A 4% withdrawal rate is totally doable based on the historical performance of a total market index fund (with dividends!). The challenge with any passive income is the sustainability of it over a long period. If I’m understanding right, the “Balance at age ___” column calculates the balance you would have at your target date, assuming no further contributions / just the growth of the account as is? If that’s the case, what does it mean in the months after the “target retirement date” has passed? Thanks Felicity. The Balance at age – is the balance at the age you have entered as your retirement age. This is just the balance up until this point. It doesn’t calculate after that fact. “You weren’t as cool as me” Haha! But for real, great calculator Grant! Thanks Matt! I’m working on a few more and I hope they will get better! Thanks! Yeah I’m still new at building these calculators. It works on some phones, but not all. So I am working on it!